Go to original pattern for design DROPS Baby 21-13. 100-150-150 (150-150) g color no 03, light yellow. DROPS STRAIGHT NEEDLES size 2.5 mm / US 1or2 - for rib. Accessory: approx 50-60 cm / 20”-23” elastic for waist. 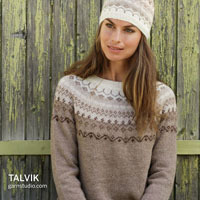 You can get the yarn to make this pattern from	8.40$. Read more. 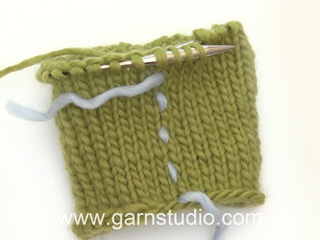 Worked in garter st back and forth on needle. Worked in 2 parts from bottom up. 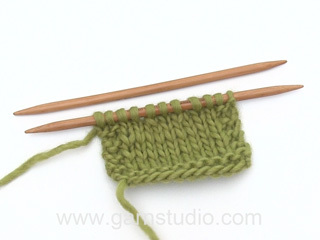 Cast on 62-66-70 (78-82) sts (includes 1 edge st in each side) on needle size 2.5 mm / US 1or2 with Baby Merino. 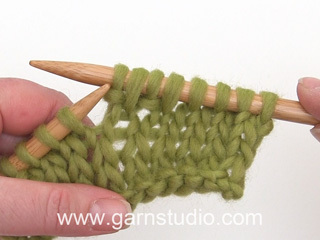 Work rib = K 2/P 2 with 1 edge st in garter in each side. When piece measures 5-5-5 (6-6) cm / 2"-2"-2" (2½"-2½"), insert a marker - NOW MEASURE PIECE FROM HERE! When piece measures 5-5-5 (6-6) cm / 2"-2"-2" (2½"-2½") from marker, switch to needle size 3 mm / US 2or3. Work in GARTER ST – see explanation above - AT THE SAME TIME on 1st row, dec 16-16-16 (18-18) sts evenly = 46-50-54 (60-64) sts. When piece measures 8 cm / 3'', inc 1 st in each side. Repeat inc every 1½-1½-2 (2½-3) cm / ½"-½"-3/4" (7/8"-1 1/8") a total of 7-8-8 (8-9) times = 60-66-70 (76-82) sts. When piece measures 18-21-24 (29-34) cm / 7"-8 1/4"-9½" (11 3/8"-13 3/8") from marker, bind off 2-2-2 (3-3) sts at beg of the next 2 rows = 56-62-66 (70-76) sts. Continue to dec 1 st at beg of row from RS (= towards mid front) – repeat dec on every other row 0-1-3 (5-7) more times = 55-60-62 (64-68) sts. Continue in garter st until piece measures 36-42-46 (52-58) cm / 14 1/4"-16½"-18" (20½"-22 3/4") from marker – now work an elevation from mid back as follows (i.e. more rows are worked on the back of pants than on the front) – start at beg of row from WS: K 11-12-12 (12-13) sts, turn piece, slip first st, tighten the yarn and K all sts back, K 22-24-24 (24-26) sts, turn piece, slip first st, tighten yarn and K all sts back, K 33-36-37 (37-40) sts, turn piece, slip first st, tighten yarn and K all sts back, K 44-48-50 (54-54) sts, turn piece, slip first st, tighten yarn and K all sts back, K 2 rows over all sts. Work in stockinette st over all sts for 2 cm / 3/4'' for hem before binding off. Cast on and work as right leg but reversed. Sew seam on inside of leg inside 1 edge st – NOTE: The bottom 5-5-5 (6-6) cm / 2"-2"-2" (2½"-2½") are sewn with overlay outwards so that the seam is not visible when the edge is folded up. 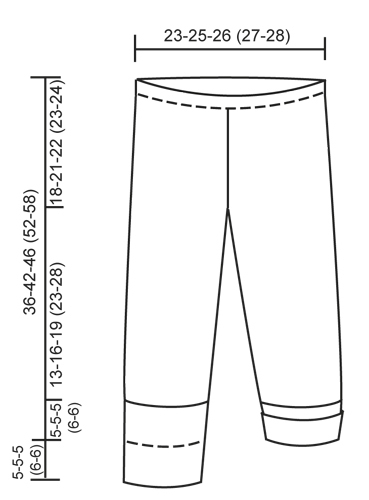 Sew pants tog all the way from mid front to mid back - sew edge to edge in outer loop of edge st. Fold the hem at the top double towards WS and fasten with neat little stitches – leave a small opening to thread the elastic through and sew it up afterwards. Fold up the bottom 5-5-5 (6-6) cm / 2"-2"-2" (2½"-2½") on legs. Hej, jeg forstår ikke hvornår jeg skal begynde forhøjningen bagpå. det læses som om at man skal begynde når arbejdet måler 36 cm (mindste størrelse), men det er jo så langt som hele buksen er, så det giver ikke nogen mening for mig. Hvor langt skal arbejdet fra mærket være før man begynder forhøjningen? Hej Julie, hele buksen er 36+5 = 41 cm God fornøjelse! Mam pytanie w związku z tymi spodenkami: czy przy przerabianiu podwyższenia z tyłu ściegiem francuskim, kończąc ten manewr, wzór będzie się zgadzał. Dodatkowo na końcu opisu techniki robienia podwyższenia jest napisane : dalej przerabiać dżersejem. Trochę się w tym pogubiłam i nie wiem czy to nie jest błąd. Pozdrawiam serdecznie. Witam, wzór będzie się zgadzał. Na końcu opisu jest dżersej, ta część jest niewidoczna i zostanie wyłożona na lewą stronę robótki i doszyta. POWODZENIA! Liebe Katti, genau, Sie stricken in der Rück-R 11 M, wenden und stricken die 11 M in der Hin-R. Dann stricken Sie in der nächsten Rück-R 22 M, wenden und stricken diese 22 M in der Hin-R. Bedauerlicherweise liegt in der Anleitung ein Übersetzungsfehler vor, der nun korrigiert wird. Viel Spaß beim Weiterstricken! Hej Caroline. Ja, du skal strikke omvendt. Dvs, du skal maska av i början på v från avigsidan og mht förhöjning mitt bak saa börja i början på v från rätsidan. Hallo, ich bin jetzt auch bei der Erhöhung steckengeblieben. Ich habe es so verstanden, dass ich zuerst 11 Maschen stricke, dann drehen und die 11 M. zurückstricken, dann 22 M.stricken, wieder drehen und zurückstricken usw. Oder habe ich das falsch verstanden? 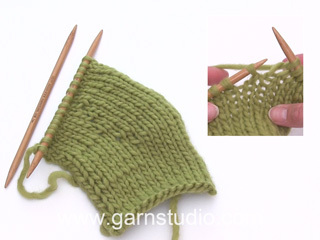 Liebe Julia, Sie stricken die 11 M, dann wenden und dann gleich die 22 M stricken - schauen Sie sich am Besten auch unsere Videotutorials zu den verkürzten Reihen an. Liebe Carmen, bei uns waren die angegeben 100 g ausreichend. Hallo Habe fuer Groesse 56/62 100 gr Wolle also 2 mal Baby Merino gekauft. Jetzt habe ich zu wenig? Laut Strickanleitung...."mit Krausrippe weiter stricken bis Arbeit 36cm misst"...36 cm von wo weg gemessen? Von Markierung am Buendchen oder messe ich ganze Arbeit Zweite Frage: die Erhoehung folgt auf diese 37 cm... oder? Danke fuer die Hilfe!! E' possibile avere delle descrizioni più semplici per queste ghettine? Sono una principiante. Non posso rivolgermi al negoziante, perchè è stata acquistata da mia figlia che vive a Oslo. Nella mia città (Siracusa, Sicilia) non ci sono rivenditori, purtroppo. Aiutatemi! Grazie! Buonasera Alba. Per riuscire ad aiutarla ci sarebbe utile sapere quale punto esatto delle spiegazioni non le sono chiare. Può trovare aiuto anche presso il nostro forum, oppure rivolgendosi al seguendo indirizzo mail: italy@garnstudio.com. Grazie e buon lavoro!